He is the man behind The Reach Dollar Baby Film. Landon Kestlinger: I’m Landon Kestlinger, the writer, director, and editor for The Reach. I am currently a student at Elon University in North Carolina. I am studying Television and Cinema Arts & History. Landon Kestlinger: Compared to many other people I was kind of late. I realized Freshman year of College. I never had a film program in High School and really didn’t film growing up. I always liked watching the behind the scenes of films and going to see movies. I guess I always wanted to do something with film, but it didn’t hit me until College. SKSM: When did you make The Reach? Can you tell me a little about the production? How much did it cost? How long did it take to film it? Landon Kestlinger: The Reach was made in November of 2017, but it wasn’t completed until January 2018. The film was made for around $200 and it took 2 days to shoot. The total time for the two days was around 10 hrs in total. We shot all in the Stella house scenes one day and the lake scene the next. Overall there was three people of the crew including myself and it was a small but experience crew. We made this fast but still took the time for getting things set up and working out problems that came along the way. SKSM: How come you picked The Reach to develop into a movie? What is it in the story that you like so much? Landon Kestlinger: It wasn’t scary or a horror, to me it was romantic and soothing. Something about your loved ones watching over you had a calming effect. After reading the short story I felt that this was the one to make into a short film. I filmed it while studying abroad in Scotland so I thought with the looks of the highlands and Loch Lomond the scenery would work extremely well. Landon Kestlinger: One of my professors mentioned it in a class, so I googled it and found out about the Dollar Babies. I keep telling other students at my school about it so hopefully there are more films being made, it’s a great opportunity. Landon Kestlinger: When I made this I knew no one is Scotland; no producers, actor, etc. I worked with the student television station [GUST] over at the University of Glasgow, which helped a lot. The think the craziest story is that my original lead actress ghosted us the day before production, I still haven’t heard from her. Luckily, thanks to my other actors, they managed to find Freda and she was filming less then 24hr later. I think the best easter egg in the film is the lake that we end up at is Loch Lomond and we sang the Loch Lomond song for Stella’s transition between life and death, thats just a fun tidbit. Landon Kestlinger: There are ways for fans to see these films in places like festivals. Mine just showed at the Cannes Film Festival Short Film Corner so some King fans could see it there. I have also submitted to other festivals where Kings fan might be able to catch it. Sometimes I wish that I could release it online, but I think that the process and experience of working with a name such as Stephen King is exciting enough. Hopefully in the future there will be more outlets, maybe paying $2 for internet rights. Landon Kestlinger: The good reviews that I have received is that it tells a story in the simplest form as well as shows potential for future endeavors of mine. The biggest criticism is the lighting and more character development. I wish I had more time and help creating the film, but overall I liked what came out. 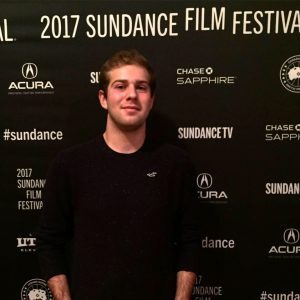 Landon Kestlinger: Like I mentioned before It was just screened last week at Cannes Film Festival Short Film Corner, I have submitted to other festivals, but still have not Heard back yet. Landon Kestlinger: I like Stand by Me, The Shining, and Carrie. My favorite story is It, I don’t know why I like It so much but it’s my favorite of his works. Landon Kestlinger: I did not have any contact with Mr. King and I don’t think he’s seen it. I would love to know how I can get him to watch it because I know it’s not the best but I would love to hear his input and how to make it better. Landon Kestlinger: I would like to, but I don’t know which one. I would just have to start Reading more of his stories and find one that calls for me like that of The Reach. Defiantly would love the opportunity to do another one of his stories. Landon Kestlinger: I am currently working on my BFA thesis film. I am in pre production on it so I can’t say much about it, sorry. What I can say is that it is a new look into the traditional sleepaway camp film. Landon Kestlinger: I’m not ordinary, I never played baseball and soccer. I snowboard and play the drums and had a interesting time growing up. Landon Kestlinger: No problem this has been fun. I would like to tell those who are reading this article and thinking that their dreams of becoming a director, writer, producer, etc. are too far away, that its not. Anything is possible you just have to work hard. Yes, things might not go right all the time, but you get through it and the experience helps you grow as a filmmaker. Go out there and make something. Landon Kestlinger: I don’t think I have much else to say except thanks you for letting me talk about my film The Reach. I hope I gave you all some insight into the process of how it was made and I can’t wait to start making the next film. Thanks again.